Worn once bodice and skirt (ie hired out once). No apparent signs of wear. Professionally cleaned and pressed. Smooth A line skirt with train (no pleats or gathers) with built in nets. 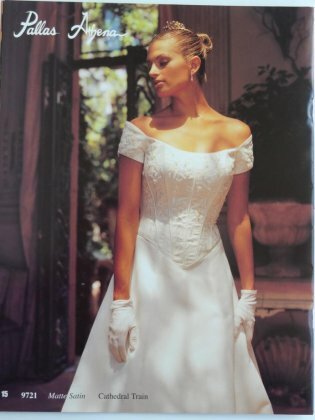 Bodice has bandeau sleeves around the upper arm. 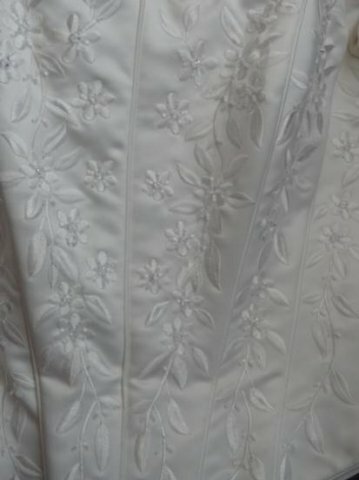 Decoration is ivory embroidery. Flowers have large glass bead in the centre with ivory bugle beads surrounding. Fastens with loops and covered buttons.